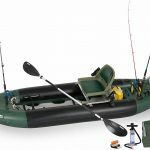 So what is an inflatable fishing boat? Anything that floats and that you can fish from, right? Well, not exactly. While you can indeed fish from anything that floats, it is far easier and much more productive to fish from a boat that’s specifically designed for fishing. And that’s the purpose of this page—to introduce anglers to the myriad of inflatable fishing boats that are available. 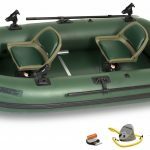 Many anglers simply don’t realize the wide variety of inflatable boats available today that are specifically designed for fishing. Additionally, this article will go over some of the “goods and bads” of each type of boat. No boat is perfect. No boat can perfectly meet everyone’s specific needs. The trick to buying an inflatable fishing boat is to make sure that the boat’s best uses match up with your own specific needs. One last thing. 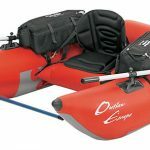 As the title of this article states, this article concentrates on inflatable boats—not rigid boats like traditional canoes or hardshell kayaks or bass boats. Do You Need an Inflatable Fishing Boat? Before diving deep into the world of these boats, we need to distinguish what separates, for example, an “inflatable fishing kayak” from a “normal inflatable kayak” you see floating around the nearby lake on a summer day. Typically inflatable fishing boats have many of the following characteristics. These “characteristics” are usually modifications the manufacturer makes to the boat to make these boats more “fishing friendly.” These “fishing friendly” features are added to make the boat more comfortable and easier to fish from, as well as allowing the addition of personalized fishing gear an angler might already have (such as fish finders or trolling motors). So here’s some common characteristics found on many inflatable fishing boats. Of course, not all boats share these characteristics. What they do share, however, is that each and every boat is specifically meant for fishing. 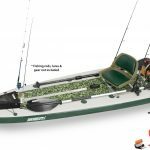 Broadly speaking, there are six specific types of inflatable boats that are specifically designed for anglers. The most portable inflatable fishing boat. But uses are limited. A popular fishing boat. Very portable, but not especially versatile. The most versatile of all inflatable fishing boats. Several “models” to choose from. The best and most comfortable inflatable fishing boat available. For those who like to fish from a canoe, but hate their weight, storage problems and lack of portability. Fishing from a surfboard? You bet, and it’s a great platform for specific fishing uses. Ultra-portability makes them ideal for backcountry fishing. Never for use on rivers or on larger lakes during windy conditions. Can be tiring to use. I personally think the Sea Eagle PackFish is a much superior to a float tube for those seeking an ultraportable, backpackable fishing boat. Quintessential fly fishing platform. Designed specifically for fishing. Very popular on rivers and lakes. Very portable, especially the new generation frameless pontoon boats. Very few are meant for more than one angler. Not the best boat for recreational floating. Can handle Class II rapids, which some able to go through Class III. Very few “comfort” items or options available. The most versatile of all inflatable fishing boats. Can run Class II – Class IV rapids, depending on design. Easy to paddle on flat water, particularly those kayaks designed for flatwater paddling. Suitable for overnight fishing trips. These kayaks typically have swivel seats, rod holders and provide an option to mount a trolling motor. 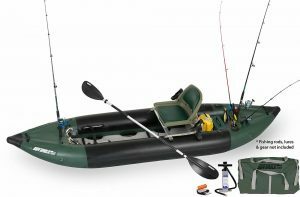 The most “fishing capable” of inflatable fishing boats. Room for 2 and sometimes more anglers. 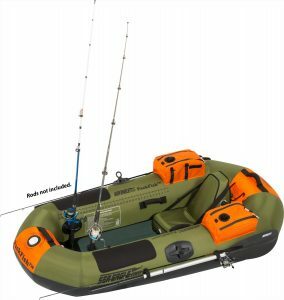 The most stable of inflatable fishing boats, making it simple and safe to stand in the boat. 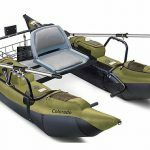 Rafts typically include swivel seats, mounting brackets for trolling or gas motors, rod and lure holders, and many more built-in features or optional accessories. Inflatable canoes are a relatively new boat. None that I’ve found are “specifically meant for fishing.” However, since canoes are popular fishing platforms, especially in the Upper Midwest and New England, I’ve included them here. The new drop-stitch construction technology used to construct inflatable canoes allows them to perform nearly identical to a traditional canoe—without having the weight, portability and storage problems a traditional canoe often presents. For anglers who enjoy fishing from a canoe but need something lighter and more portable, an inflatable canoe might be a great choice. A stand-up paddleboard converted to dedicated fishing uses. Gas and trolling motor mount options. Reasonably lightweight and quite portable. Optional swivel seats and rowing platform. Drop-stitch construction makes the board very rigid. Anglers can stand without capsizing the boat. Not suitable for rivers with rapids. Best uses are on lakes and in very shallow waters, including ocean bays. Whether or not you need a dedicated fishing boat, inflatable or not, depends entirely on one big thing. How often do you fish? Serious anglers, who fish weekly or even daily, will definitely appreciate having a boat dedicated to fishing. The comfort, features and accessories available will make fishing more enjoyable and, usually, more productive. Casual anglers, however, might just want to buy a more general inflatable boat of some kind. After all, you can indeed fish from “anything that floats.” And many inflatable boats, particularly inflatable kayaks, are great fishing platforms even if they lack some of the fancy features found on a dedicated inflatable fishing kayak. 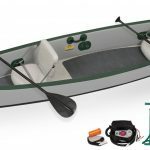 Moreover, many “general” inflatable kayaks can be turned into decent fishing kayaks with the purchase of a few simple accessories—such as a motormount or a frame that includes a swivel seat. Ultimately, the choice is yours—and should be based on how often you find yourself on the water chasing fish. Regardless of whether you buy a dedicated inflatable fishing boat or a more all-around boat for a mixture of fishing and recreational floating, I encourage all readers of these articles on Big Sky Fishing to avoid the trap of buying cheap inflatable boats. These cheap boats are cheap for a reason. The quality of materials is often of low quality. More ominously, these cheap boats have a nasty tendency to either develop leaks while in storage or develop tears on the boats seams. And seam tears are not easily repairable. The good news is that quality inflatable boats—whether dedicated to fishing or used for a mixture of fishing and recreational uses—are not that expensive. A quality inflatable kayak or raft is easily found for $300 or so. So save yourself aggravation and—in the long run—your pocketbook some money by purchasing a quality inflatable boat “out of the gate.” In time, you’ll be very happy you did.